Continuing the guest reviews of my esteemed Comic Book Teacher friends, I present to you an amazing chunk of graphic novel reviews by my main man Jason Nisavic. Jason is a Social Studies teacher in my district. He has used graphic novels to great success in his classroom, he runs our school’s improv team, and he also heads the Gay/Straight Alliance; I tell you this because Jason is a busy dude, so I appreciate it when he comes through with some top-notch reviews! This is the last of Jason’s seventh guest review in a row, so if you are just jumping on now, I suggest that you check out the other six. One fantastic leap that graphic novels have made in our lifetime has come with the rise of “high-minded” material. Need evidence that this literary resource is no longer just the realm of kids and the young-at-heart? Look to this fantastic adaptation of the U.S. Constitution, this analysis of the Warren Commission Report, and the subject of today’s review, an expansive explanation of the meaning behind every word of the Gettysburg Address. Jonathan Hennessey’s work with the U.S. Constitution changed the way that I taught my U.S. Government course. He does an even better job of breaking down “the masterpiece of modern English eloquence” that is Lincoln’s address. 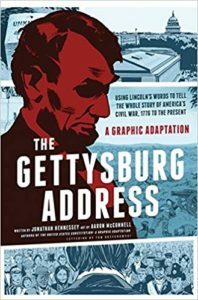 The book suggests that since Lincoln was an exceedingly careful writer, every piece of his address was composed in exacting detail. Hennessey treats us to a line-by-line breakdown accompanied by contextual background and evidence to explain why those words were chosen (and why others were omitted!). The end product is a dense journey from the founding of the republic to the Civil War and beyond. The educational value of The Gettysburg Address, in my opinion, is not in using its entirety but rather by carving it into its naturally occurring chapters for students to analyze. There are also a multitude of discussion questions to be found in its pages (e.g. ; “When was the republic really founded and why does that matter?”). I could even see a U.S. History course beginning the school year by examining the beginning of the book and then revisiting it as the chronological portions become relevant. Hennessey’s work is great for everyone who is a student of history!